Climatic conditions within the Water Authority's service area are characteristically Mediterranean along the coast, with mild temperatures year-round. More than 80 percent of the region's rainfall occurs between December and March. Average annual rainfall is approximately 9.9 inches per year on the coast and in excess of 40 inches per year in the inland mountains. 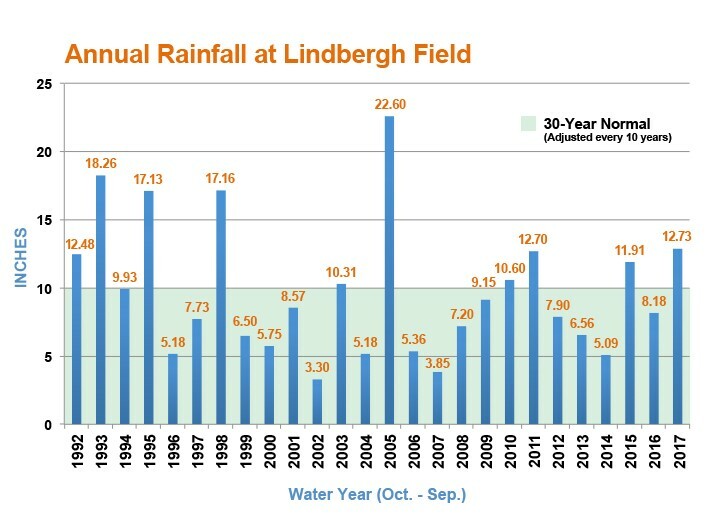 Below are links to local historic rainfall totals for Lindbergh Field, Lake Cuyamaca, and Lake Henshaw.